It was an auspicious debut. The credits on page one of Daredevil #158 read, “From time to time a truly great new artist will explode upon the Marvel scene like a bombshell ... Frank Miller is such an artist!” At age twenty-two, Frank Miller, largely unknown and uncredited, became the illustrator of one of the core characters in the Marvel Universe. Daredevil, created in 1964 by Stan Lee (with Bill Everett), was unique, a handicapped superhero. It was an auspicious debut. The credits on page one of Daredevil #158 read, “From time to time a truly great new artist will explode upon the Marvel scene like a bombshell … Frank Miller is such an artist!” At age twenty-two, Frank Miller, largely unknown and uncredited, became the illustrator of one of the core characters in the Marvel Universe. Daredevil, created in 1964 by Stan Lee (with Bill Everett), was unique, a handicapped superhero. Blinded as a youth in an accident involving radioactive waste, Matt Murdock’s other senses were enhanced, granting him extraordinary abilities. The adult Murdock became a lawyer who, by day, defended the residents of his Hell’s Kitchen neighborhood. At night, he donned a red devil costume and became “The Man Without Fear,” fighting evil beyond the law’s reach. In his first ten issues, Miller drew stories written by others. However, the stories were ordinary, sales were declining and cancellation loomed. 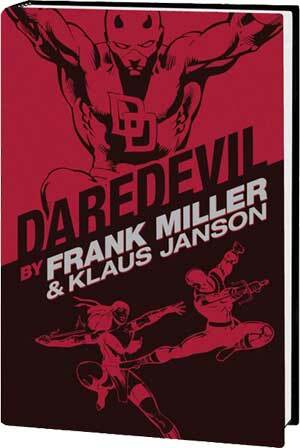 Then, management at Marvel shifted, and Miller was given the unprecedented opportunity to both draw and write Daredevil, shattering the long-held division of writer, who crafted the plots, and artist, who brought the plots to life on the page. Miller’s integration of writing and drawing allowed him to create a singular unity of vision. He distorted and manipulated his drawings until they reflected his character’s inner reality. Miller has credited movie directors Fritz Lang, Orson Welles and Alfred Hitchcock and Will Eisner, the creator of the graphic novel, as having influenced his art. While influences are evident, Miller exceeds them by creating a compelling style of graphic storytelling that has influenced subsequent takes on Daredevil — including the current Netflix series. Miller tightened and darkened the plots, the art and the action. He created new characters, most notably Elektra Natchios – “mercenary, bounty hunter, assassin and, long ago, Matt Murdock’s first love” – who appears in Miller’s first solo issue and goes on to become an integral part of the overall storyline. He borrowed the cartoonish “Kingpin” Wilson Fisk from the pages of Spider-Man and reimagined him as a ruthless, malevolent crime lord. And for comic relief, he introduced the hapless hoods Turk and Grotto. Miller compressed his characters into stories unlike those in any other Marvel comic. There were no more super-villains of the month. No one in Miller’s stories could fly or swing among the skyscrapers of New York City on strands of spider webbing. And no one was invulnerable. Pain and blood became the real consequence of punches, kicks and being thwacked with Daredevil’s billy club. Most importantly, Daredevil changed from just another “righting wrongs” superhero into a very human, complex character trying to find sense and order in a complex, morally ambiguous world and in his own tumultuous life. The evolution of Miller’s artistry as it progresses through the series is fascinating to watch and the gut-tensing, emotional stories are a terrific read. As the series progressed, Miller slowly withdrew from completely penciling the artwork, instead producing breakdowns that were finished by his long-time inker and collaborator, Klaus Janson, who gets co-credit in this collection of ground-breaking work. Miller would go on to create the hugely successful Batman: The Dark Knight Returns (which heavily influences “Batman v Superman: Dawn of Justice,” in theaters Thursday). He would write and direct movies, including the film “The Spirit.” While two later works, the crime series Sin City and the historical graphic novel 300, would be made into major motion pictures, the films retained the unique visual style Miller created for the books. But it all started nearly forty years ago, on the first page of Daredevil #158.